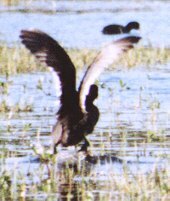 American Coots, most abundant in the winter, are found in wetlands statewide. Coots, the only Florida birds with white bills, often gather in very large flocks. They feed primarily on aquatic vegetation and fish and sometimes steal plants from ducks. They appear ducklike in the water, but are actually shaped more like a chicken. Rather than webbed feet, their toes are widely lobed, serving them both in the water and on the mud. What began as courtship -- the male swimming toward the female with his head and neck extended on the water -- quickly turned into a high-speed chase.